Since 1987, the Art Gallery of Mississauga (AGM) has hosted this annual exhibition celebrating collaboration with Visual Arts Mississauga (VAM). VAM is a not-for-profit charitable organization with a mission to enrich community life by fostering an appreciation of the arts through active involvement in a variety of creative experiences. This annual collaboration with VAM is among the many ways by which the AGM activates its mandate to “bring art to the community and the community to art.” as well as the Gallery’s mission, centred upon the words “Engage. Think. Inspire.” The VAM call for entry is one of the region’s most anticipated visual arts events, and this exhibition is an opportunity for art enthusiasts to survey a broad spectrum of work by artists who range from graduating students to senior members of the visual arts community. Stuart Keeler, a cultural producer with broad international experience in curating, programming, writing about and commissioning contemporary artists, public art and socially based interventions in the public realm. Lila Lewis Irving, a well-known abstract painter who believes that spontaneity is the root of invention for an artist. Camille Turner, a media/performance artist and educator whose interventions, installations and public engagements have been presented throughout Canada and internationally. 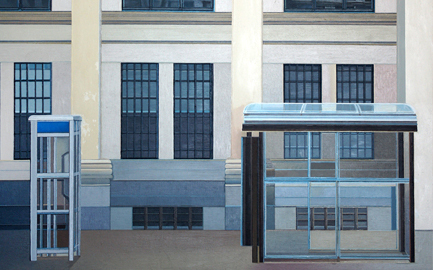 Image Credit: Visual Arts Mississauga 37th Annual Juried Show of Fine Arts Winner, 2015: Susan Clark, Transitional Shelters, 2014, Oil on Panel. Image courtesy of the artist. Private Collection of Robert Tattersall.